Extremely comfortable to wear and easy to use, Ion Science’s Cub is the world’s smallest, lightest and most sensitive personal photoionisation detector (PID). Boasting market-leading anti-contamination technology and humidity resistant operation, the Cub is ideal for the protection of workers in chemical, petrochemical, oil & gas and pharmaceutical processing facilities, as well as health & safety, hazardous materials, first response and environmental applications. When worker exposure exceeds pre-set limits the Cub’s upgraded audible, vibrating and flashing LED alarms provides an alert to the gases present. Readings are displayed on a bright, back-lit LCD display with selectable data logging time. An independent alarm sounds to the employee but also records a quantifiable measure of exposure to VOCs. The Cub is available as a ppm instrument with 10.6 eV lamp for accurate detection of a wide range of VOCs to ppm levels. The CubTAC ppm variant with 10.0 eV lamp accurately detects total aromatic compounds (TACs), including benzene, down to ppb levels. 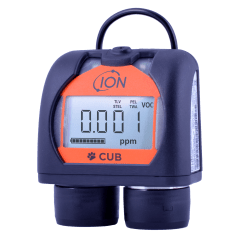 The Cub (ppm) can be upgraded to ppb sensitivity quickly and easily via Ion Science’s micro website. Docking stations are available for USB communication, charging and calibrating the Cub. The instrument’s patented MiniPID sensor technology has been independently verified as best performing for speed, accuracy and humidity resistant operation. The Cub’s innovative anti-contamination and patented Fence Electrode Technology provide extended run time in the most challenging environments. It meets ATEX, IECEx standards and responds to hazardous gases and vapours in less than 13 seconds. A two-year warranty is available when the Cub is registered online.